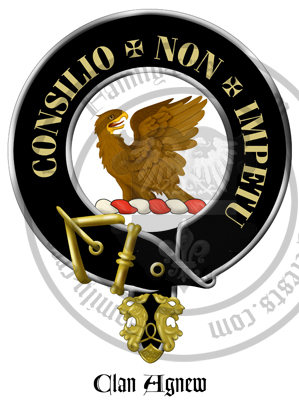 Clan Badge: An eagle issuant and reguardant proper. 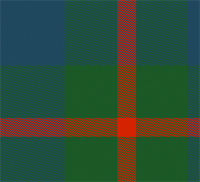 Clan Agnew is a Scottish clan from Wigtownshire and Galloway in the southwest of Scotland. 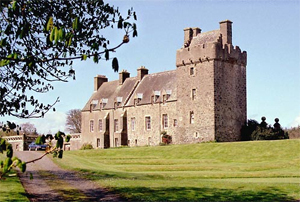 Current Clan Chief: 11th Baronet Sir Crispin Agnew of Lochnaw. Sir Crispin is a leading expert on Scottish clans and is Rothesay Herald of Arms in Ordinary at the Court of the Lord Lyon. 1. Scottish (of Norman origin): habitational name from Agneaux in Manche, France. 2. Irish and Scottish: Anglicized form of Gaelic O Gnimh 'descendant of Gniomh', a byname meaning 'action' or 'activity'. The O Gnimhs were hereditary poets to a branch of the O'Neills; in this family the traditional pronunciation is with the stress on the second syllable. Arms: Argent, a chevron between two cinquefoils in chief gules and a saltire couped in base azure. Crest: An eagle issuant and reguardant proper. Supporters: Two heraldic tigers proper, collared and chained or. Azure, a St Andrew's cross argent in the hoist and of two tracts argent and gules, upon which is depicted the badge three times along with the motto 'Consilio non impetu' in letters or upon two transverse bands sable.